I never was much of a scout, and I hate camping and that kind of thing. But recent events in Japan have reminded me of the importance of being prepared. I don’t want to be a scaremonger, but earthquakes and other natural disasters are a reality of life, and we get very little warning when they hit. So, it pays to be prepared! The area I live in, Hamamatsu in Shizuoka Prefecture, was largely unaffected by the Tohoku earthquake on 11th March, although we did feel it. I think the thought in most people’s minds that day was “is this the big one?”. 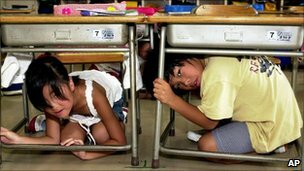 “The big one”, or the “Tokai earthquake” was predicted in 1976 and people are still waiting for it to come. It hangs like a sword of Damocles over the people of central Japan, but I find it is rarely mentioned. Why? Because people are as ready as they’re ever going to be. Get under a desk or table if everything is shaking too much for you to move. If you can’t get under a desk or table, stand in a door frame – it’s the strongest part of the building. As soon as you can, open doors and windows – they could get crushed and then you would be trapped. Get out into an open space as soon as you can! So what can you really do to be prepared? As I said, you don’t get much notice when an earthquake hits, and of course it could happen at any time of day. 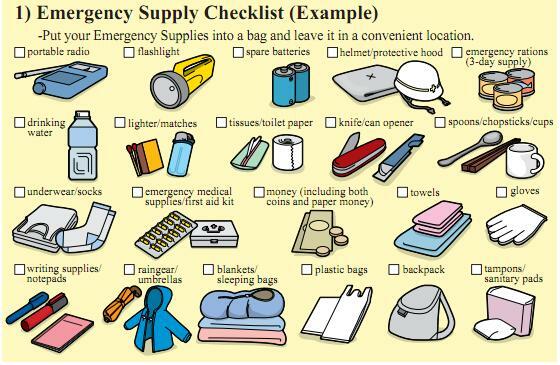 But the most practical thing anyone can do to prepare for such an event is to prepare an “emergency bag”. Many Japanese keep these bags in their houses, just in case. It’s taken from this fantastic English language Earthquake Disaster Prevention Guidebook. If you’re moving to Japan soon or already living here, my intention is not to scare you. I just want to make sure that everyone is being sensible and prepared. I’m sure I was always told as a kid that “if you prepare for the worst, it will never happen” – so let’s prepare! Candles? Really? We’ve been getting aftershocks (in Christchurch) way too big for candles to stay upright (even chunky ones). And if the mains water is switched off (likely in the event of anything major) the fire brigade will struggle to put out any fires ….. I don’t mean to scare anyone but maybe consider sticking with battery powered torches, okay? Very good point Bob – thanks! I hadn’t thought about it actually – I was just going on what people around me had been saying. Let’s stick with battery powered torches (flashlights) people!